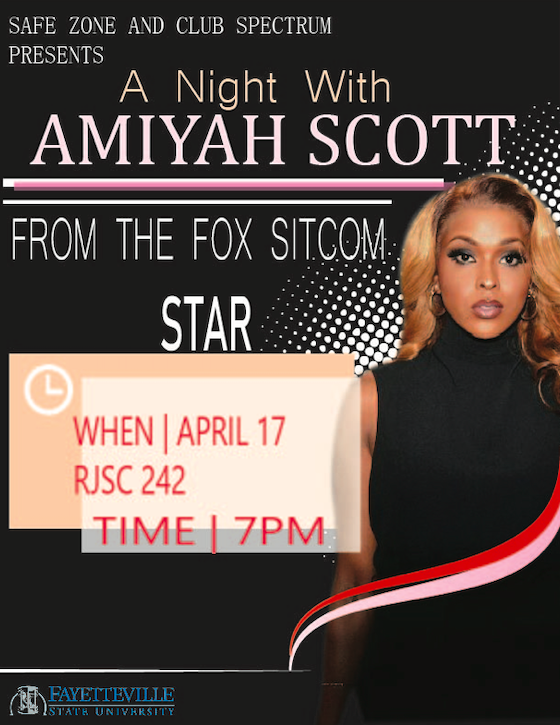 Scott will appear on April 17, 2019, at 7 p.m., in Room 242 of the Rudolph Jones Student Center. It is free and open to the public. Pride Week will include a full week of events and activities developed to raise awareness and visibility of LGBTQ related issues and needs, promote education, and foster a sense of community on campus. The goals and objectives of Pride Week align with the University's vision statement, mission, core values and core identity and the Council for the Advancement of Standards (CAS) in Higher Education. The planning and implementation of Pride Week is a collaborative effort by students, staff and faculty members. Scott was named Arthur Scott at the time of her birth, as she was born a male. However, she always felt that she was a female trapped in a male's body. As a result, she told her family that she no longer wanted to be male. Without her parent's blessings, Scott underwent a partial transgender surgery at the age of 15 years and fully transitioned to a female at the age of 17. Uncomfortable with her parent's disapproval of her choice, Scott moved out of her family home and began making a living for herself. Undeterred by bullying and criticisms from her community, Scott went on to start a career in modelling, ballroom dancing as well as acting. Shortly after she left home, her parents decided to accept her the way she was and became supportive of her career. In no time, Scott was able to build a large social media following. She is known for her signature colorful eccentric wigs, makeup and entire fashion sense. She has named the likes of Rihanna and Lil' Kim as her biggest style inspirations. Today, she is an actress who has landed a role in the hit TV show, Star. Scott also is the first transgender woman to be named as a regular cast as member of the American reality television series, The Real Housewives of Atlanta (RHOA). For more information about Pride Week, contact Dr. Brent Lewis at blewis22@uncfsu.edu or Dr. Emily Lenning at elenning@uncfsu.edu.